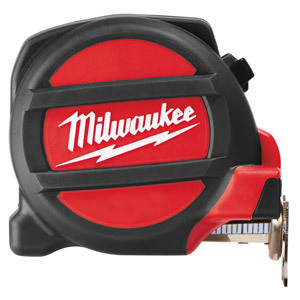 Milwaukee 5m Metric Premium Tape Measure with dual magnetic hook. 5-point reinforced frame for job site durability. Dual magnets: one magnet holds the hook in front; a second magnet prevents roll off on the material. Architect scale: is integrated for easy calculating of scaled drawings (ISO 5455). Enables to measure distances and calculate material demand directly on construction site. 5 m side measures: 1:20 and 1:50 scales. Overmould gripping for area for extra comfort and durability.